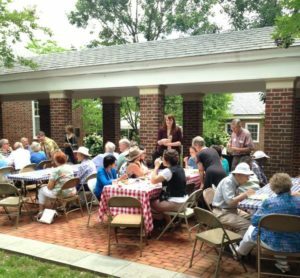 Sharing food and fellowship on a warm spring day after worship. Westminster welcomes all persons who respond in trust and obedience to God’s grace in Jesus Christ and desire to become part of the membership and ministry of Westminster Presbyterian Church. Westminster affirms and accepts each person as created with a unique combination of qualities: cultural heritage, color, talents, sexual orientation, abilities, and diverse interests. Profession of faith: Persons make their public profession of faith in Christ and receive Baptism after appropriate instruction and examination by the Session. Reaffirmation of faith: Persons who have previously made a profession of faith and been an active member members in another church and are unable to secure a certificate of transfer will after appropriate instruction and examination by the Session will make a public reaffirmation of their faith and accept responsibility in the life of the Church. Certificate of transfer from another church: Persons who have made a public profession of faith and were active members in a particular church may be received by the Session upon receipt of a certificate of transfer from the church in which they have most recently been members. Those interested in joining the church should contact one of the pastors. New member classes are offered three times during the year and prospective and new members are strongly encouraged to attend these classes. Prospective members will appear before the Session and then be publicly recognized by the congregation at its service of Holy Communion on the first Sunday of the following month. When my spouse and I decided to make Charlottesville our home, our next step was finding a church also to call home. Although we didn’t have children at the time, our plan to grow our family was in the making. We wanted the church to be an integral part of our lives and our future children’s lives. With so many area churches, the search could have been very difficult. But as soon as we set foot in Westminster and heard Jim speak, the search was over. We were welcomed in so many ways and felt at home immediately. Our family has now grown to include two children who are being raised at Westminster. It has truly been a blessing to be a part of such a wonderful, active congregation. In this class we will begin with our individual experiences of grace, exploring our faith roots, before moving on to our current needs and interests for spiritual growth. This class should be of interest to prospective and new members of Westminster – as well as to established Westminster members who want to reflect on their faith and discipleship – and who desire to welcome and get acquainted with some of the newest participants in the Westminster community.